I’m on a watercolor roll! Here’s a fun card to kick off the summer season. A lovely summer day at the beach. 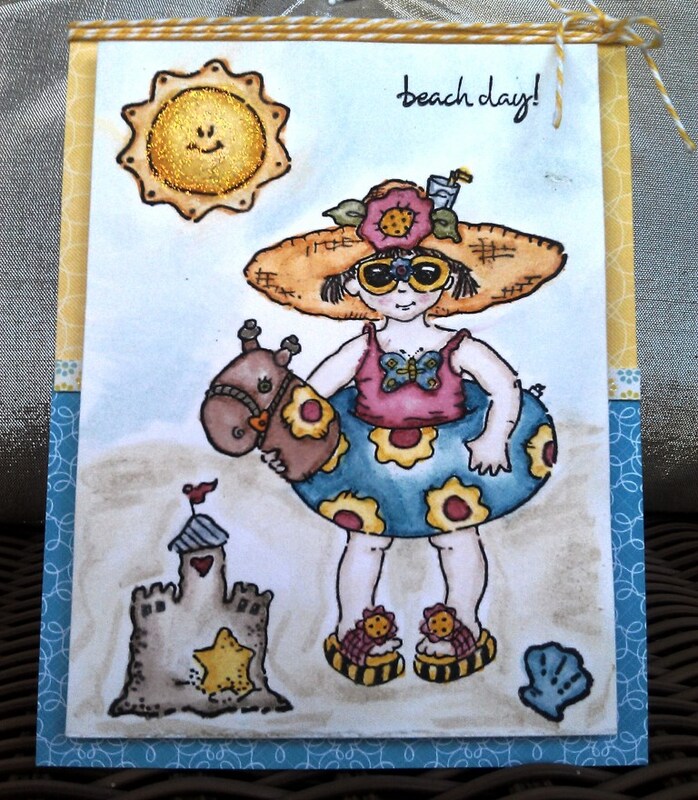 I absolutely love this Beach Day stamp set from Penny Black. The little girl so reminds me of my little niece on the beautiful Gulf Coast of Florida, resolutely making sand castles and bossing her older cousins when they waded too far into the surf. Makes you ready for summer vacation, doesn’t it? Once again I used my Tim Holtz Distress Markers and a water brush to color the images. It’s funny, I was so “in the zone” when I colored this, I automatically colored the toy horse’s head brown, without realizing the rest of the inner tube was blue. Oh well, my horse inner tube is two-toned! Makes it unique! LOL. To mimic the sand and blue skies, I used extra water with the tan and blue markers to lightly paint the background. I added Diamond Stickles to the sun to make it sparkle. The paper is from the DCWV Citrus Matstack. The final touch was a yellow and white Doodlebug twine wrapped at the top. Please let me know what you think. I hope you have a wonderful summer vacation, hopefully with at least a little time at a beach, river or lake!